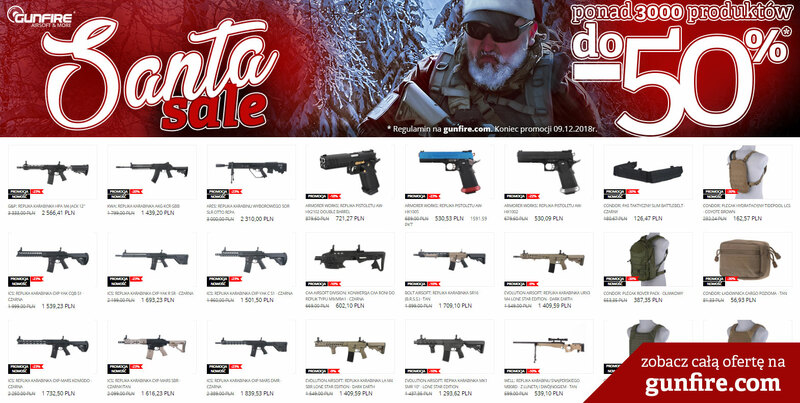 Santa Sale przybyła do Gunfire! Ponad 3000 produktów nawet do -50%! Santa Sale w Gunfire! Ponad 3000 produktów nawet do -50%! We hope that you have been good this year and attended airsoft games regularly. If so, our Tactical Santa has prepared a really long list of amazing discounts for you! On it you will find replicas of gas pistols by SRC, Well sniper rifles and a wide selection of bags, rucksack, pouches and many other tactical accessories from FMA and Primal Gear. In addition, Santa's sack is filled to the top with various kinds of parts such as motors, springs, grips and silencers from Tornado and Element. Do not wait and see now what else can be found in the Gunfire's Santa Claus Special Offer!